As Trump Cancels Obama’s Cuba Policy and Signs New One, Who Benefits? President Trump in June moved to halt the historic rapprochement between the United States and Cuba as set in motion by former President Barack Obama. Trump delivered a speech in Miami where he announced he is clamping down on travel and commercial ties with the island. When Trump gathered in Miami his fan-based, slogan ebullient and cheerful crowd of former campaign days, most likely the same constituents of a microcosm that unfolded nationwide and on Election Day 2016 gave Donald Trump a stunning win in Florida and nationwide. The purpose, restoring some travel and economic restrictions on Cuba that were lifted as part of the Obama administration’s historic easing. But Trump’s Cuba policy reversal is bad for change in its core. Fulfilling his campaign pledge, Trump ordered a clampdown on Cuba travel and trade, curbing Obama detente. As he said, he was cancelling former President Barack Obama’s “terrible and misguided deal” with Havana. After he laid out his new Cuba policy, Trump signed a presidential directive to roll back parts of Obama’s historic opening to the Communist-ruled country after a 2014 diplomatic breakthrough between the two former Cold War foes. 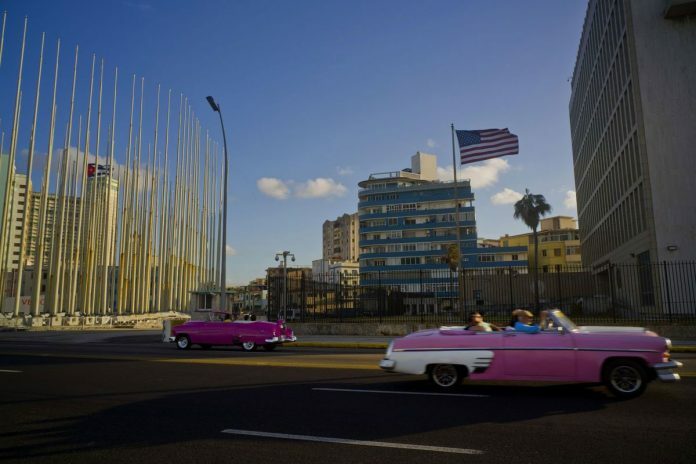 But Trump was leaving in place many of Obama’s changes, including the reopened U.S. embassy in Havana, even as he sought to show he was making good on a campaign promise to take a tougher line against Cuba. Trump’s revised approach calls for stricter enforcement of a longtime ban on Americans going to Cuba as tourists, and seeks to prevent U.S. dollars from being used to fund what the Trump administration sees as a repressive military-dominated government. But facing pressure from U.S. businesses and even some fellow Republicans to avoid turning back the clock completely in relations with communist-ruled Cuba, the president chose to leave intact some of his Democratic predecessor’s steps toward normalization. The new policy bans most U.S. business transactions with the Armed Forces Business Enterprises Group, a Cuban conglomerate involved in all sectors of the economy, but makes some exceptions, including for air and sea travel. This will essentially shield U.S. airlines and cruise lines serving the island. Trump justified his partial reversal of Obama’s Cuba measures to a large extent on human rights grounds. His aides contend that Obama’s efforts amounted to “appeasement” and have done nothing to advance political freedoms in Cuba, while benefiting the Cuban government financially. Some politicians in Miami and also within the Trump’s administration feel they are stuck in the past after his speech where he gave many hints to going back to the long and complicated history the US and Cuba has had since the Cuban revolution in 1959. He referred to the 1960 Bay of Pig invasion, to the Brothers to the Rescue incident in the mid 90’s. That all was part of a past Trump is not familiar with but fueled by a dissident generation in Miami where Marco Rubio comes from. A much younger generation of Cubans and Cuban-Americans are not seeking that past moving forward. So how can a Trump administration make any difference in the lives of the new generations of Cubans in the island with such a speech? Cuba’s government – according to Cubans themselves – is not perfect. They recognize there’s political repression, but also think that the way to get more people involved in addressing the future is to have more interaction with the US, not being isolated. Reversing Obama policy is the US being more restrictive towards Cuba because of what a remnant minority of Cuban exiled hard-liners want. It will only scare away travelers from the US and that will stall changes. Though Trump sounded harsh when he said “Effective immediately, I am canceling the last administration’s completely one-sided deal with Cuba,” in fact his new policy towards the island keeps almost intact all major breakthroughs Obama implemented. Trump stopped short of breaking diplomatic relations restored in 2015 after more than five decades of hostilities. He will not cut off recently resumed direct U.S.-Cuba commercial flights or cruise-ship travel, though his more restrictive policy seems certain to dampen new economic ties overall. Nor does Trump plan to reinstate limits that Obama lifted on the amount of the island’s coveted rum and cigars that Americans can bring home for personal use. While the changes are far-reaching, they appear to be less sweeping than many U.S. pro-engagement advocates had feared. Trump recently came back from a foreign trip where he visited countries they still chop people’s heads off and to scold Cuba because of its handling of human rights is impartial and hypocritical. Every four years this Cuban community in Miami is very strong for the aspirations of any presidential candidate to come true. Florida catapulted Trump to the presidency. He crushed Clinton in the suburbs and rural areas, capitalizing on enormous enthusiasm for his anti-status quo message. Definitely, the Cuban community helped much. Tampa Bay – where there’s also a large Cuban community – delivered Florida to Trump. While “White” American voters supported Trump at a rate of 56%, Cuban American voters went for the Republican candidate at a rate of 58%. So Trump had to deliver on his promises and reverse whatever possible of Obama’s Cuba policy not fitting at all with the hardliner exiles as possible. Trump himself – though just barely 300 days into his presidency – is aiming for a 2020 rerun. Bonus: You can also learn more about Cuba in a few minutes in the following collateral article. On the eve of Fidel Castro’s 1959 revolution, Cuba was neither the paradise that would later be conjured by the nostalgic imaginations of Cuba’s many exiles, nor the hellhole painted by many supporters of the revolution, who recall Cuba as “the brothel of the Western hemisphere” — and saw it as an island inhabited by a people degraded and hungry, whose main occupation was to cater to American tourists at Havana’s luxurious hotels, beaches and casinos. Rather, Cuba was one of the most advanced and successful countries in Latin America. Cuba’s capital, Havana, was a glittering and dynamic city. Cuba ranked fifth in the hemisphere in per capita income, third in life expectancy, second in per capita ownership of automobiles and telephones, first in the number of television sets per inhabitant. The literacy rate, 76%, was the fourth highest in Latin America. Cuba ranked 11th in the world in the number of doctors per capita. Many private clinics and hospitals provided services for the poor. There were, however, profound inequalities in the Cuban society — between city and countryside and between whites and blacks. In the countryside, some Cubans lived in abysmal poverty with macheteros — sugarcane cutters, working only four months out of the year as the sugar production was seasonal, living on the margins of survival. Many poor peasants were seriously malnourished and hungry. Neither health care nor education reached those rural Cubans at the bottom of society where illiteracy was widespread. At the foothills of the Sierra Maestra, people died waiting for transportation to the nearest hospitals and clinics in Santiago de Cuba. Racism also blighted the Cuban society. Private clubs and beaches were segregated. Even President Fulgencio Batista, a mulatto, was denied membership in one of Havana’s most exclusive clubs — Havana Yacht Club. Cuba’s social problems were compounded by a violent, chaotic and corrupt political history. Carlos Alberto Montaner, one of the most read journalist in the Hispanic world who was born in Cuba and resides in Madrid and Miami, once said that “Batista’s coup in 1952 opened a Pandora’s box. Institutions no longer mattered. What mattered was audacity, the individual capable of violent action”. On January 1, 1959, Bastista formally resigned to his position in Cuba’s government and went through what English historian and writer Hugh Thomas describes as “a charade of handing over power” to his representatives, remaining family and closest associates. He then boarded a plane at 3 a.m. at Camp Columbia and flew to Ciudad Trujillo in the Dominican Republic. When Castro took power, he nationalized all U.S.-owned businesses, including oil refineries, factories and casinos, and that prompted the United States to end diplomatic relations and impose a trade embargo that still stands today. About 1,400 Cuban exiles trained and funded by the CIA landed near the Bay of Pigs in 1960 with the intent of overthrowing Castro. Their plans ended in disaster. Ultimately, more than 100 exiles were killed and nearly everyone else was captured. In December 1962, Castro freed them in exchange for medical supplies and baby food worth about $52 million. Castro publicly declared himself a Marxist-Leninist and he lead the country to increasingly become dependent on the Soviet Union for economic and military support. He abolished legal discrimination, brought electricity to the countryside, provided for full employment and advanced the causes of education and health care, in part by building new schools and medical facilities. But he also closed down opposition newspapers, jailed thousands of political opponents and made no move toward elections. Moreover, he limited the amount of land a person could own, abolished private business and presided over housing and consumer goods shortages. With political and economic options so limited, hundreds of thousands of Cubans, including vast numbers of professionals and technicians, left Cuba, often for the United States. Though there are no exact numbers, some outlets estimate that tens of thousands were murdered, with a documented 5,600 killed by firing squads alone. Two specific incidents — the 1980 Canimar River Massacre and the Tugboat Massacre of 1994 — had put Cuba in hot waters in regards to human rights violations. These events triggered that hundreds of thousands more Cubans fled the country, many settling just across the Florida Straits in Miami. The largest of these exoduses occurred in 1980, when Castro opened up the port of Mariel to allow exiled Cubans living in Miami to go to the island and claim their relatives. In all, nearly 120,000 Cubans left their homeland in 1980 to find sanctuary in the United States. Cuba’s economy went into a tailspin and Castro’s revolution began to lose momentum after the 1991 collapse of the Soviet Union. Cuban unemployment and inflation grew. Dire econo-mic times started for the Cuban people. Then Castro’s government adopted a quasi-free market economy, encouraged international investment, legalized the U.S. dollar, and encouraged limited tourism. By 2001, 118 factories were closed and thousands of Cuban doctors were sent to Venezuela in exchange for oil imports. Even as Western-style democracy swept the globe and other communist regimes in China and Vietnam embraced capitalism, Castro remained steadfast on his ideology and hard-line government, leaving an island of 11 million people an economically crippled Marxist bibelot. Though President Obama took action to cut loose the anchor of failed policies of the past, and to chart a new course in U.S. relations with Cuba. The time for the world “to draw close to Cuba” actually started to take shape in 1998 when President Clinton decided to allow Cuban Americans to resume sending money directly to relatives on the island and to permit charter flights from the United States to Cuba in an effort to capitalize on a changed atmosphere for Cuba inspired by the visit of Pope John Paul II. The Treasury Department and other agencies started to simplify licensing procedures for exporting medicine and medical devices to Cuba, though the moves did not signal a weakening of the long-standing U.S. embargo on trade with Cuba as a cornerstone of efforts to isolate and undermine the communist regime of President Fidel Castro. Obama started the end of a Cold War-era policy towards Cuba and ushered in the path to normalizing relations with Cuba and to promote a democratic, prosperous, and stable future for Cuba. He became the first U.S. sitting president in nearly 90 years to visit Cuba. The Cuban revolution disrupted many people’s privileged lives and families lost everything they owned, having to flee to the United States. To others, it gave a roof over their heads, educated their children, put food on their table and gave real chance of social advancement, once denied to many Cuban people. For decades, Cuba and the United States framed their relationship as a conflict of opposites: Communism vs. Capitalism; Cuban loyalists vs. Cuban exiles; the state vs. the individual. After Obama’s visit to Cuba, old battle lines have begun to fade away, even with broad support in the exile community for loosening travel rules, and allowing Cuban-Americans more freedom to go back. The United States restored diplomatic relations with Cuba, though has maintained the commercial, economic, and financial embargo against the communist island. Economic relations with the country had been aggressively being restored with a number of changes as recently as of October 2016, including the easing of travel restrictions on the island in an attempt to create more economic opportunities between the two countries, and regulatory changes intended to expand scientific, humanitarian, trade and commercial opportunities between the U.S. and Cuba. 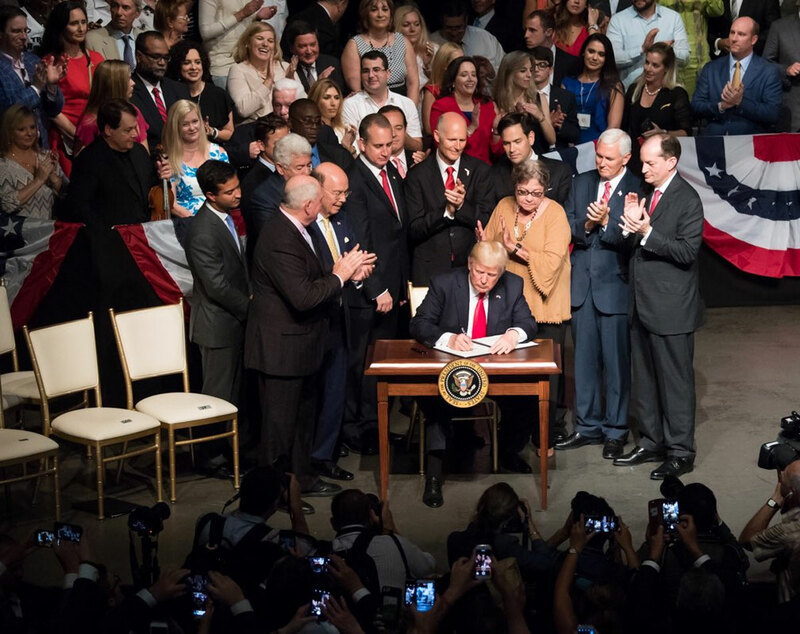 President Donald Trump declared Friday, June 16 he was restoring some travel and economic restrictions on Cuba that were lifted as part of the Obama administration’s historic easing. He challenged the communist government of Raul Castro to negotiate a better deal for Cubans and Cuban-Americans. Trump said Cuba had secured far too many concessions from the U.S. in the “misguided” deal but “now those days are over.” He said penalties on Cuba would remain in place until its government releases political prisoners, stops abusing dissidents and respects freedom of expression. This statement by President Trump brings the rhetoric of his Trumpism movement to Cuba through a minority community in Miami that wants to keep old carrot and stick policies. International human rights groups say, however, that again isolating the island could worsen the situation by empowering Cuban hard-liners. The Cuban government has made clear it will not be pressured into reforms in exchange for engagement. Even former U.S. President Jimmy Carter had given mixed messages when he spoke directly to the Cuban people on May 14, 2011. Speaking live and uncensored on Cuban state television, Carter urged Cuba to join “the community of democracies,” explained human rights as defined by the United Nations Universal Declaration of Human Rights, and revealed the existence of a petition signed by more than 11,000 Cubans that calls for a national referendum on guarantees of human rights and civil liberties. Yet Mr. Carter also suggested the United States lift its principled embargo on trade with the regime of dictator Fidel Castro as a goodwill gesture to restore relations. The US embargo has always harmed Cubans and given the Castro family an excuse for the policy failures of their regime. As in the the live, televised speech to the people of Cuba, Carter challenged his host, communist dictator Fidel Castro, to allow free speech, free elections – and free religious worship; so did President Trump in Miami with the hopes the Cuban government would listen to him. None of the above will happen if the embargo is still in place. It has never happened since the U.S. ratcheted up sanctions on Cuba in 1960 and 1961 with President John F. Kennedy making the embargo official in 1962. It caused many Cubans to flee the island to seek refuge in Miami, one thing now the new generation cannot do as the “Pies Secos, Pies Mojados” law «wet feet, dry feet policy» is no longer in effect. The U.S. Embargo against Cuba has gone through four decades of failure and it is destined (under Donald Trump and Marco Rubio) to go on. That’s not what Americans want. That’s not what the majority of the new generation of Cubans wants. The history of Cuba and its people is like others in our world, yet at the same time, U.S. – Cuban relations do not resemble others in the hemisphere. In a general sense, Cuba and the United States have a lot to learn from each other and a lot to gain from a process of rapprochement. Trump Cancels Obama’s Cuba Policy, Signs New Policy. Trump’s Cuba Policy Reversal Clamps Down on Travel & Commercial Ties with the Islands. Bad for Change.